Do You Want the Strongest, Most Effective Gutter Protection Solution on the Market? Choose Gutter Filter by DunRite Exteriors! Clogged gutters negate their benefits. Depending on the geographic region, they can fill with leaves, pine needles, oak tassels, asphalt and other shingle debris, and nests that harbor infestation. They can trap stagnant water in the debris and become a breeding area for mosquitoes. Dried debris, particularly pine needles, create a potential fire hazard during drought conditions in areas prone to forest fires. In areas subject to winter conditions, clogged gutters cause dangerous icicles and water damming, forcing melting water to back under shingles and leak into the interior. Water in foundations can freeze, crack and buckle. Gutter Filter is pioneering the way for gutter guards, Gutter Filter has been tested and is recognized to carry the highest ratings and results that outperform the competition. What Are the Benefits of Gutter Filter? Gutter Filter is stainless steel micro mesh that is not too small to restrict the water-flow but is not too large to allow debris into the gutter. Gutter filter can be added onto your existing gutters. Gutter Filter adds 50% more strength to your existing gutters. Gutter Filter is a cost-effective solution to clogged gutters. Gutter Filter does not install under your roofing compromising your roof warranty it fastens directly into the same fascia board your gutters are fastened to. The Gutter Filter frame is made of aluminum which will not warp or become ineffective under all temperatures 365 days a year. Gutter Filter is not a product that needs to be replaced, it’s a Lifetime product Guaranteed! Lifetime Transferable No-Clog Guarantee that is backed by a Money Back Guarantee as well. Installation can take a few hours or up to a full day depending on the scope of work. #1 Remove all debris from your existing gutter system including the downspouts. #2 Inspect the gutter system and assure the gutters are pitched properly and new fasteners and re-pitch as needed. #3 Install new hidden hangers and seal as needed, we can also install new gutters if necessary. #4 Install Gutter Filter on your existing gutters to add 50% more strength and protect your gutters for a Lifetime. A Gutter Filter Representative will meet with you at your home and determine your needs. #1 The Representative will inspect your home to determine if your existing gutters are in good shape. #2 The Representative will measure your home to determine all the lengths, pieces and parts that make up the cost of your project. #3 The Representative will determine if your home would be a candidate for a full or partial protection plan. #4 The Representative will go over a detailed proposal so all customers are completely understanding on what is being installed. 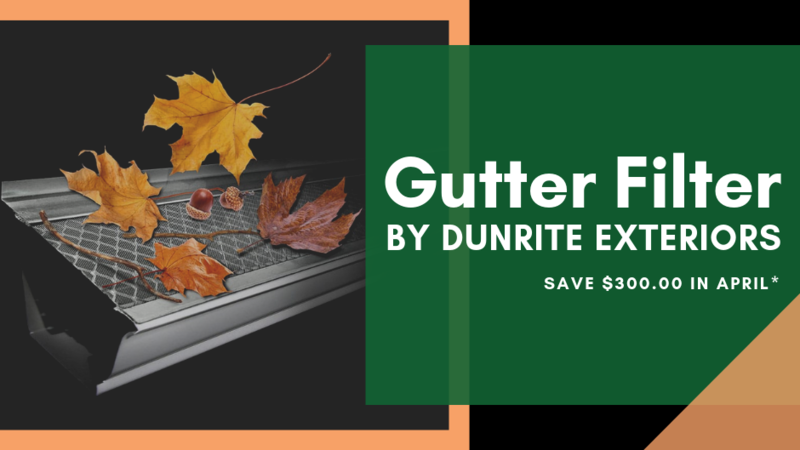 Want to Find out Even More About Gutter Filter by DunRite Exteriors? Click here! is a proud member of the National Association of The Remodeling Industry. Responsive Website Design by Xtreme | © Copyright 2017. All Rights Reserved.